The right triangle altitude theorem or geometric mean theorem is a result in elementary geometry that describes a relation between the lengths of the altitude on the hypotenuse in a right triangle and the two line segments it creates on the hypotenuse. It states that the geometric mean of the two segments equals the altitude. The latter version yields a method to square a rectangle with ruler and compass, that is to construct a square of equal area to a given rectangle. 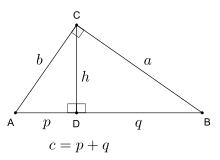 For such a rectangle with sides p and q we denote its top left vertex with D. Now we extend the segment q to its left by p (using arc AE centered on D) and draw a half circle with endpoints A and B with the new segment p+q as its diameter. Then we erect a perpendicular line to the diameter in D that intersects the half circle in C. Due to Thales' theorem C and the diameter form a right triangle with the line segment DC as its altitude, hence DC is the side of a square with the area of the rectangle. The method also allows for the construction of square roots (see constructible number), since starting with a rectangle that has a width of 1 the constructed square will have a side length that equals the square root of the rectangle's length. The converse statement is true as well. Any triangle, in which the altitude equals the geometric mean of the two line segments created by it, is a right triangle. The geometric mean theorem can also be thought of a special case of the intersecting chords theorem for a circle, since the converse of Thales' theorem ensures that the hypotenuse of the right angled triangle is the diameter of its circumcircle. Historically the theorem is attributed to Euclid (ca. 360–280 BC), who stated it as a corollary to proposition 8 in book VI of his Elements. In proposition 14 of book II Euclid gives a method for squaring a rectangle, which essentially matches the method given here. Euclid however provides a different slightly more complicated proof for the correctness of the construction rather than relying on the geometric mean theorem. A division by two finally yields the formula of the geometric mean theorem. Dissecting the right triangle along its altitude h yields two similar triangles, which can be augmented and arranged in two alternative ways into a larger right triangle with perpendicular sides of lengths p+h and q+h. One such arrangement requires a square of area h2 to complete it, the other a rectangle of area pq. Since both arrangements yield the same triangle, the areas of the square and the rectangle must be identical. Wikimedia Commons has media related to Geometric mean theorem.